There is a lesson for lenders in the pages of Citizens Commercial Banking’s Middle Market M&A Outlook 2018. “If you’re not talking to your customers about M&A, someone else will,” says Ralph M. Della Ratta, head of M&A Advisory, Citizens Capital Markets. In many ways, the results of this year’s survey are similar to those of 2017, but they reflect an even stronger optimism and desire on the part of buyers to find quality companies to purchase. 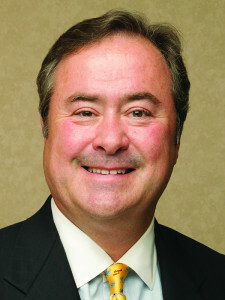 Della Ratta joined Citizens Financial Group last year when the bank acquired his company, Western Advisory, a Cleveland-based M&A advisory firm. The annual survey quizzes business executives from U.S.-based middle market companies with revenues ranging from $25 million to $3 billion that are engaged in some form of corporate development. The data this year was collected between October 17, 2017 and November 10, 2017. Citizens received 410 completed surveys from both businesses that anticipate buying in 2018 and those interested in selling. 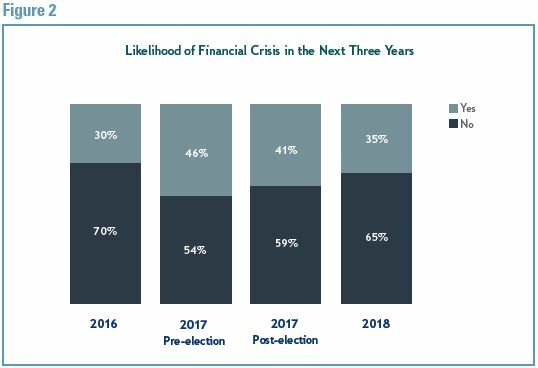 In 2017, Citizens conducted surveys before and after the presidential election and found that, although both buyers and sellers contended that the election did not have an impact on their outlook, there was increased optimism after the Trump election. That feeling has grown even stronger in the last year as the administration passed a new tax bill, although it has failed, so far, to remove the Dodd-Frank regulations. The baby boomer effect is still anticipated, and Citizens predicts that millions of boomers who have put off retirement will finally see the light and put their businesses on the market (See Figure 1). 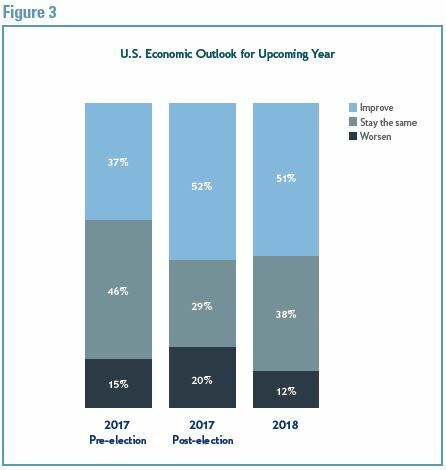 Overall, post-election optimism remains high, and survey results show that fears of an imminent downturn are declining (See Figure 2). Still, inflated optimism is like a balloon — it only takes a pinprick to flatten. Several days after Della Ratta shared his unbridled optimism, the stock market took its deepest dive ever, causing many people to worry the ground wasn’t as secure as they thought. “I think that it is too early to tell if the recent volatility will have a negative effect on the M&A market,” he says, responding to the freefall on Wall Street. “If this situation continues in this vein for a few more weeks, I would imagine that it will have a dampening effect on the deal market. Survey results show the results of the 2016 presidential election have fueled confidence among buyers and sellers (See Figure 3). This year, the sellers anticipate increased activity, with 60% of middle-market decisions makers indicating they are either currently involved in a sale or merger or considering one within the next 12 months. That is an increase of 33% from two years ago. If the sellers are eager to put themselves on the market, the buyers are even more aggressively seeking acquisition. More than 76% of the decision-makers surveyed said they are involved in or considering an acquisition within the next 12 months. The challenge, according to Della Ratta, is that too many buyers are chasing after too few quality companies. What makes a quality company? Della Ratta says a company prime for acquisition has a good position in its niche, strong management and impressive financials. “Numbers that should be going up, go up, and those that should be going down, go down,” he says. “People are pushing for trophy companies,” he says, adding that Citizens recently represented a consumer products company with a unique position in the industry and good multiples. The bank was able to generate a substantial profit. The recent decline in the U.S. dollar, he notes, has sparked an interest by Asian and European buyers in acquiring U.S. companies. According to the survey, in 2017, 63% of sellers said they were prepared for sale and 25% said they were expecting to be acquired. This year, those numbers have soared to 68% and 35%, respectively. On the buyers’ side, acquisition interest also remains strong, although survey results have not varied much for the past three years with a third of those interviewed currently involved in an acquisition. The biggest switch has been in the group that was not considering an acquisition, which has swung from 36% in 2016 to 23% in 2018. 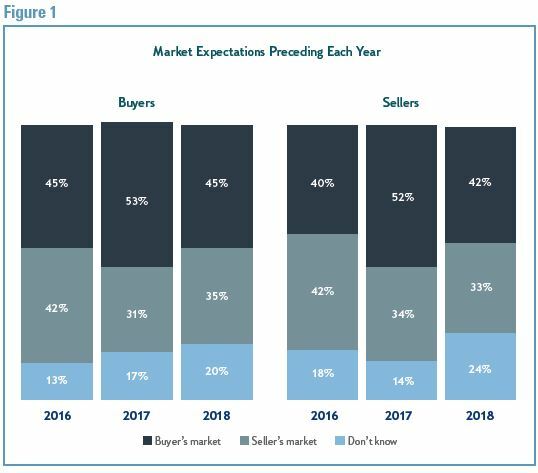 Meanwhile, buyer confidence is at an all-time high with 47% of buyers confident they can achieve growth through acquisition, up from 33% last year, and 40% confident they will make such an acquisition in the next 12 months, up from 23% in 2017. “All the stars are aligning in the right way,” says Della Ratta, who predicted that the new tax legislation would restore confidence in the economy and encourage companies like Apple to repatriate their money from overseas.